Amazon Buys Twitch, Proving Gaming Live Streams Are Golden : All Tech Considered Twitch broadcasts gamers to huge audiences around the world, and it boasts big potential when it comes to advertising dollars. Amazon CEO Jeff Bezos calls watching gameplay "a global phenomenon." 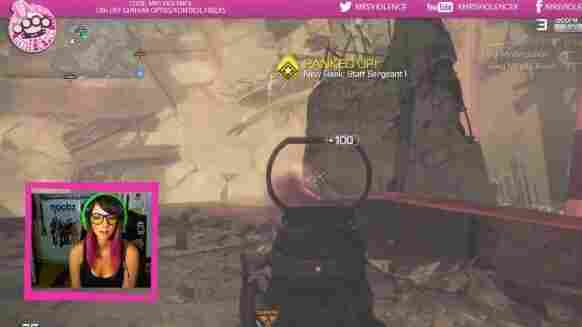 Kelly Kelley, who goes by the gaming pseudonym MrsViolence, streams her play nightly for her many fans to watch. There's another billion-dollar buyout in tech today [OK, it's about $970 million, but close enough] and this time it's Amazon's purchase of the video game streaming service Twitch. Twitch is a company that lets you watch video gaming as a spectator sport — it live-streams gamers gaming and allows viewers to interact during the games, to enormous success. Twitch now boasts 55 million monthly active users, a count that's only growing. A recent graph of the peak Internet traffic in the U.S. puts Twitch ahead of Hulu, Valve and Amazon, behind just Netflix, Google and Apple. And, as we've previously reported, it's helping launch careers: Gamers play live on Twitch, people watch and they can cash in. Amazon sees value in all of that. "Broadcasting and watching gameplay is a global phenomenon and Twitch has built a platform that brings together tens of millions of people who watch billions of minutes of games each month," Amazon founder and CEO Jeff Bezos said in a statement. Advertising dollars will be an obvious revenue source. Research firm eMarketer estimates digital video advertising in the U.S. will reach $5.96 billion this year, up more than 40 percent from 2013. Twitch made headlines when 100,000 people played a game of Pokemon together — imagine the product tie-in potential there. "Because Amazon is eager to own more and more of its content destiny — and thus avoid some of the problems it has had with Hachette and Disney as of late — it's clear that Amazon will want to find more content that it can control. Twitch is a good fit this way because it captures people's attention for hours a week and it also creates a product tie-in opportunity that Amazon can capitalize on in a way that Google could not." Earlier this summer, Google was reportedly nearing a $1 billion deal to buy Twitch. Google, which owns YouTube, would have been able to turn YouTube into an even bigger video behemoth if it also hosted video game streaming, but Amazon swooped in. "Like Twitch, we obsess over customers and like to think differently, and we look forward to learning from them and helping them move even faster to build new services for the gaming community," Bezos said.